Auto analysis of digital imagery is increasingly becoming more sophisticated as algorithms are developed to accurately differentiate between people and objects from their environment in real-time. Imagery captured by digital video cameras can be analyzed to count the number of pedestrians, identify their location, document their speed, and in some cases identify demographics such as age, gender, and what people are doing (i.e. walking, running, sitting). Through facial recognition, the emotion of the users could also potentially be obtained. MIT’s Senseable City Lab and the Austrian Institute of Technology teamed up with SLR Engineering and BMW Guggenheim Labs for the Sense and the City event to demonstrate how this technology could be used to automatically detect human use of space and analyze the space’s use over a specific time period. SLR’s smart cameras are integrated with software that can accurately analyze pedestrian movement. The short video excerpt at the top of this post shows the technology can recognized pedestrians and map their movements within the space. The following video demonstrates the work of B. Zhou, X. Tang and X. Wang at MIT. They have developed Coherent Filtering analysis using video that illustrates pedestrian movement patterns in public spaces. The intricate relationship between all of the individuals produces interesting patterns within the spaces. In this video, Zheng Wu with The Mathworks, provides additional insight into how the software is tracking the pedestrians and the potential means of anonymized by only reading the silhouettes of the individuals rather than capturing the video that can identify an individual through facial recognition. Wireless networks are a common amenity within many public spaces. The ubiquity of the smartphone and other wifi enable mobile devices can communicate with these networks. Unless users turn off their wifi networks, the devices will search out and ping these networks as it looks for them and alerts the user of their existence. A network of wifi base stations can be used to track pedestrian movements through a space and estimate their location in real-time. This technology is becoming popular for retailers to analyze the movement and length of stay within their establishments. They can also understand how many people pass by their stores and those who decide to enter. Companies like Motorola, Euclid Analytics, and others are offering variations of this technology to retailers. This technology made the news in London last year when it was learned that an advertisement project by Renew London used wifi enable recycling receptacles to record the number of people on the street. It appears the company responsible was experimenting with the technology and under public pressure quickly ceased collection of the data. 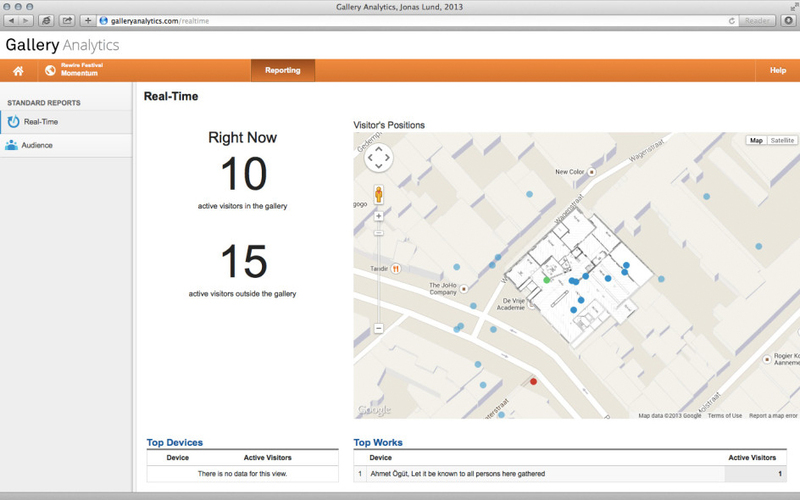 Another interesting and less controversial project titled “Gallery Analytics” used wifi tracking to create a analytics website modeled on Google Analytics. The system designed by the Swedish artist Jonas Lund for the Momentum Exhibition during the ReWire Festival in the Netherlands documents the movement of people with smartphones and identified unique visitors, percentage of people entering the gallery versus those passing by, which artworks where most viewed, and who were returning or were new visitors. This project clearly demonstrates the blur between the cyberspace and the real world and the types of data that that can be captured. While the technology is limited to those with wifi enable devices, the growth in such devices will continue to narrow this gap. The larger question is as we moved to mobile networks will wifi be used and will security concerns prompt more people to turn off this feature. As demonstrated by the Renew London project, there can be considerable backlash to this type of data collection over concerns about privacy and how the data will be used. Informing the public to its use and clearly defining what information will be collected is critically important when considering using this for public space analysis. Our mobile phones are another treasure trove of information about how we use public space. Mobile telecommunication companies are easily able to identify the location of their users. Pablo Valerio wrote about the growing use of this type of data collection and its usefulness to city planners in a piece for Future Cities titled “Cities Want More of Your Cellular Data”. In it he describes the data collected by mobile companies has mostly been used by mobile carriers for internal purposes and by police departments. However, the mobile phone carriers are beginning to look for ways to monetize this location data and make it available to both marketers and city planners. Another one of MIT Senseable City Lab’s projects Real Time Rome (2006) demonstrated how this type of data can be used to track pedestrians and visualize their movements in the City. Depending on how the mobile networks decide to make this location data available in the future, the cost and implementation of its use may be complicated and/or inaccessible except in special circumstances like the Real Time Rome project. The following video illustrates the data captured by the Real Time Rome projects during the World Cup match between Italy and France. Carlo Ratti, director of the MIT’s Senseable City Lab, provides a narrative to it in his 2011 TED talk. MIT Senseable City Lab is continuing to push the boundaries of what is possible when it comes to the analysis within urban environments. Their 2012 project Kinect Kinetics demonstrated an interesting use of inexpensive 3D sensors such as those found in Microsoft’s Xbox Kinect system. They used an array of these sensors to create a three dimensional outline of pedestrians passing under them. They claim a 94% accuracy for discerning pedestrians compared with manual annotation. Even though the infrastructure for this type of technology is not as wide spread as the others, it does offer an alternative means of capturing this type of data. The recent announcement of Google’s Project Tango, a smartphone with a built-in 3D Scanner may could change this and make 3D scanned environments much more common. While the aforementioned technologies are by no means exhaustive of those available, they do illustrate the potential of a future where cities can accurately and in many cases cost-effectively acquire data about the use of the public realm. The unprecedented availability of real-time data will have a significantly increase our understanding of public spaces and the form of the city itself. 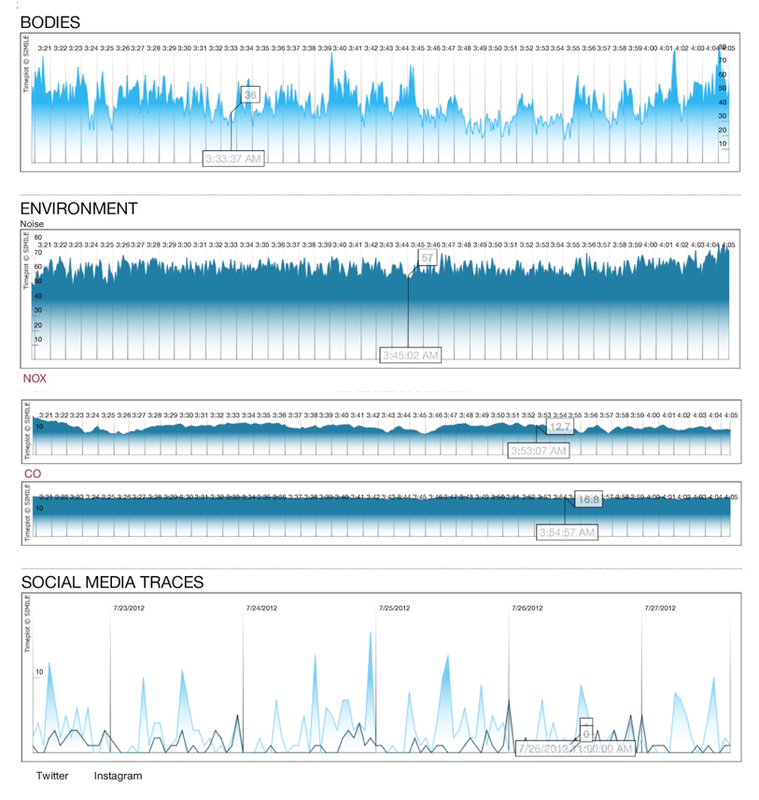 This information could improve the use of and responsiveness of the public realm to meet the users needs. Balancing these benefits with privacy concerns and cost is an important consideration. The debate over what is appropriate to record and what data is relevant and necessary will inevitably continue. What is clear is the capabilities of systems to analyze and collect this data will continue to become more sophisticated and new technologies we never thought possible will emerge. It is an exciting frontier that designers will need to understand in order to become active participants in shaping its future. This entry was posted in Smart Cities and tagged digital video, Infrared camera, mobile, pedestrian tracking, post occupancy survey, Public Space, wifi. Bookmark the permalink.